I'm home from our vacation, and fighting a flu - think all the travel wore me down. 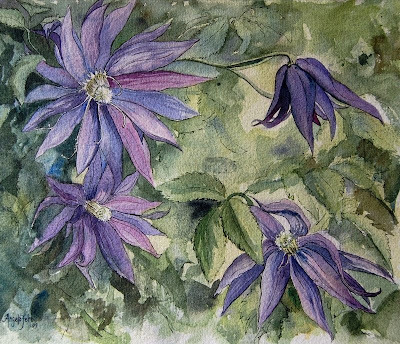 I did want to share the completed clematis watercolor painting. I used a fine tip pigment pen to add definition to flowers and some of the foliage and it was fun to see the flowers take on more defined shape. I'm pretty sure these are Jackmanii clematis. I've come home resolved to prioritize a bit better. My children are growing up so swiftly - my two girls are in school this fall. I am a home educator, so I won't be waving goodbye as they board a school bus, and the demand on my time will be increased rather than lessened. I'm setting goals to make their time as small ones a blessing for me, rather than a chore. I'm hoping that if I ditch the many little time wasters I have been enjoying online I will be able to both enjoy time doing fun stuff with my kids and painting more. I loved having time to paint while on holiday and I do need that creative outlet. Time management is definitely my greatest battle. One thing I am excited about and hoping to make time to do is take a personalized online painting class from a BC artist I admire, Karen Martin Sampson. She's offering six week classes and they sound very flexible - tailored to meet the student's needs. Take a look! She's suggested that I work on composition, and she's right - planning a painting, making thumbnails, etc. always frightens me somehow.